The Council on Tall Buildings and Urban Habitat (CTBUH) announced the winners of their 16th annual awards program at the 2018 Tall + Urban Innovation Conference in Chicago. Located at 626 First Avenue, the American Copper Buildings received the top award for Best Tall Building Americas. 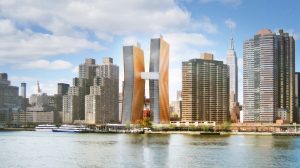 The tallest copper-clad buildings in the world, this residential property consists of two angular structures rising 47 and 40 stories above the East River. A glass skybridge connects the towers on floors 27 through 29, offering residents such amenities as a 75-foot lap pool and a fitness center. Metropolis Group secured approvals for the new buildings, which were completed in 2017. Located in a flood zone, the project was one of the first that had to comply with post-Sandy flood regulations, a complex process that required a separate review. Dual foundations created additional challenges, which required special coordination with the Excavation Unit. An independent review of new projects, the CTBUH Tall Building Awards seek to enrich the view of these significant structures, while advocating for improvements that enhance the lives of the individuals who use these buildings and the cities where they are located. It was a pleasure helping the exceptional project team realize their design vision, and we love seeing clients receive industry awards for their cutting-edge work. In December 2017, Curbed named the American Copper Buildings “Building of the Year” during its 14th Annual Curbed Awards.